With school starting today we have spent the last week preparing to get back into routine. Going to bed at regular times, buying new outfits (my daughter has grown so much this summer), getting shoes and most of all talking about lunches. Recently my sister and daughter (7 years old) have gone gluten free. My sister for health reasons and my daughter because gluten upsets her tummy. Lunches are going to be a bit of a challenge but we are up for it. Tuesday: Green salad with left over chicken and cucumbers and ranch dressing, oranges, baby carrots and tzatziki sauce, hummus and gluten free crackers. Juice box and a bottle of water. Not too bad for a first day back! Wednesday: Baked potato with sloppy joe meat (Warm meat and put in thermos), homemade gluten free cookies, a banana and blueberries. Juice box and a bottle of water. I should note here, I make my sloppy joe sauce from scratch (1 jar chili sauce, 1 cup ketchup, 2 tbsp. yellow mustard, 1 tbsp. garlic powder and 2 tbsp. Worcestershire sauce) You need to check the chili sauce and Worcestershire sauce to ensure they are gluten free! Thursday: 2 Hard-boiled eggs, carrot sticks with ranch dressing, cut up ham and rice crackers, apple slices and fruit gummies. Juice box and a bottle of water. Friday: Taco salad, strawberries with yogurt, hummus and gluten free crackers, gluten free cookies. Juice box and a bottle of water. Sure being gluten free takes more time and imagination but my daughter feels better and I know is much healthier for her. Gluten is used as a filler in a lot of items that you would not think. Read labels and especially watch for it in the following: Spice blends, marshmallows, Soups, deli meats, potato chips and salad dressings. 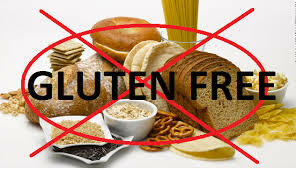 Gluten is added to many foods that you typically would not think contain it.